Nearly 5 years in the making, the duo known as La Floa Maldita return with a unique release that will set a new precedent. This special 2 disc set features 11 new tracks on an audio CD plus 8 full length videos and behind the scenes footage on the DVD totaling nearly 60 minutes. Salut Jacques is a brilliant combination of Rhea's swirling vocals mixed with Guido's layers upon layers of intellectual programming and guitars. 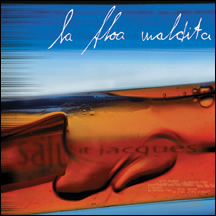 Sung in both French and English, Salut Jacques features club friendly tracks such as "Secrets and Dreams" and "Stay" along with more sultry, seductive and powerful tracks like "Liaison Fatale" and "Chanson d'Amour." Overall La Floa Maldita's return is a breath of fresh air and well worth the wait.